You are here: Home / Get Our Free Maui Wedding Guide! Get our Maui Wedding guide, and get the secrets to having the Maui Beach Wedding of your dreams! Our experienced wedding planner, Susan Craft, since 1998 has organized tips from her years of experience helping happy couples plan the perfect destination wedding in Maui. You’ll find the best wedding ideas, plus all the DO’s and DONT’S to make your Maui wedding stress-free. We’re offering it FREE, because we want you to have a great destination wedding in beautiful Maui. We make it easy for you to have a beautiful beach wedding in Maui! 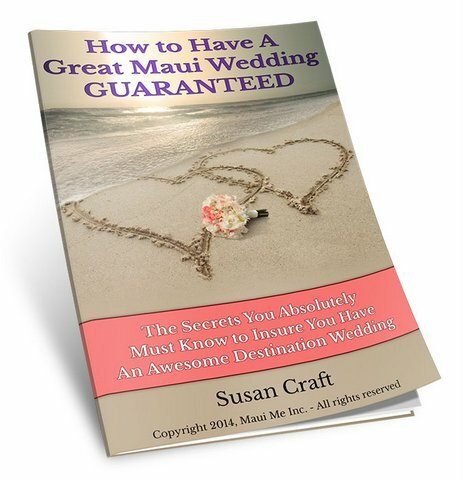 Susan Craft has worked with thousands of very happy couples since 1998 planning Affordable Maui Weddings. In this guide, she shares tips to making sure your wedding is the perfect event that you desire.